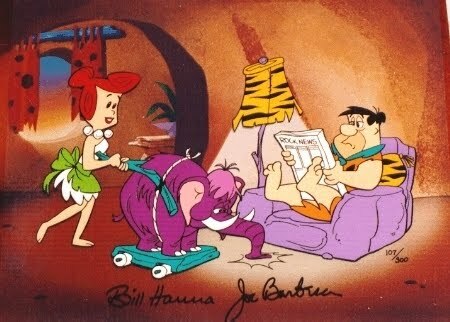 The conceit of the Flintstones animated series is that prehistoric life faithfully emulated modern life except machines used rocks, animals and people power in place of motors. Hence Fred drove a car, but made it move using his feet. Wilma vacuumed the floor using a mammoth’s trunk (connected to a live mammoth). Melissa Cheyney and the homebirth midwives of Oregon have set out to create the Flintstones version of midwifery. How else to explain Auscultated Acceleration Testing? First a little background. I have written many times about fetal monitoring and how intermittent auscultation provides only a fraction of the amount of information of an electronic fetal monitor. For example, intermittent auscultation is incapable of parsing the most ominous fetal heart rate tracing. In addition, intermittent auscultation cannot be used to verify the well being of the baby through a non-stress test (NST). Not until now that is, since Melissa Cheyney recently came up with the Flintstones version of an NST! A non-stress test, as its name implies, evaluates the baby in the absence of pitocin induced contractions. NSTs are graded reactive or non-reactive. In a reactive NST, the fetal heart rate accelerates for at least 15 beats per minute (bpm) above the baseline for at least 15 seconds, at least twice in a twenty minute period. The NST is the gold standard for determining fetal well being. A reactive NST is almost a sure sign of a healthy baby. Here’s an image of a reactive NST. 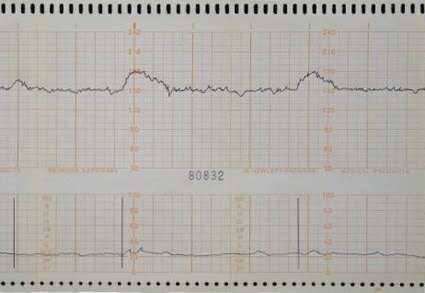 You can see that the baseline fetal heart rate is 150 bpm and there are two accelerations up to 180 bpm, each lasting approximately 40 seconds. Not surprisingly, it is impossible to perform an NST using intermittent auscultation, which is a problem for homebirth midwives since it is the gold standard for assessing fetal well being. But wait! What would the Flintstones do? The Flintstones would jury rig a set up that appeared to be able to perform the same function using only the tools available to them, but could never actually work in reality. Melissa Cheyney and colleagues have brazenly (and with a straight face) proposed the Flintstones alternative to an NST. It is called Auscultated Acceleration Testing. Not surprisingly, it requires tools that are easily accessible to a homebirth midwife such as a fetoscope and a watch with a second hand. Step 1 – Listen to fetal heart rate (FHR) for 2 minutes to establish a baseline rate. Step 2 – To do this, count the FHR in every other 5-second increment and record on an AAT collection graph. Step 4- If no fetal movement occurs in the 2 minutes following the initial shaking procedure, repeat steps 1, 2 and 3. Step 5 – Continue collecting data for an additional 2 min. and end at 6 minutes. It’s difficult to imagine anything more moronic. First of all, using a regular watch means that there is no way to know if it is keeping time correctly. This is especially critical considering that the “test” involves measuring heart beats in 5 second increments and multiplying by 12 to obtain the heart rate. Even the tiniest error in timekeeping is going to be magnified by a factor of 12, rendering any results meaningless. Second, the extremely small time increment means that any error made by the time keeper is also multiplied by a factor of 12. Consider that the normal fetal heart rate is anywhere from 120-160 bpm. In a 5 second increment, that would be 10 – 13.3 beats per increment. It is literally impossible to get an accurate reading of the fetal heart rate by listening to a 5 second increment. Even if it were possible to get accurate, meaningful information from this exercise (and it is not), it does not even meet the criteria for a reactive NST, which translated into 5 second increments would be a sustained increase lasting at least three 5 second increments. So this is a test done with an inaccurate timekeeping device by an inaccurate time keeper (since it is literally impossible to get an accurate reading of fetal heart rate in a 5 second increment) that doesn’t even provide the information needed to satisfy the criteria for a reactive NST. It is to an electronically monitored NST what Wilma using a mammoth trunk is to vacuuming. It provides a bizarre cartoon appearance of an NST that can’t possibly work in the real world. From where did Wilma Flintstone Melissa Cheyney dredge up this bit of idiocy? Midwives around the world often work with minimal resources because technology is not available to their populations. In locations where electronic fetal monitoring (EFM) is available, the nonstress test (NST) is currently the most widely used technology for screening fetuses at risk for antepartum fetal death or other poor perinatal outcomes. In other settings, low-technology methods such as fetal heart rate auscultation or maternal fetal movement counting may offer the only means of antepartum assessment available to midwives. Interest in an inexpensive, easy-to-use antenatal screening test lead to the development of the auscultated acceleration test (AAT) in the late 1980s. Using a fetoscope, midwives or nurses can easily administer this test, which is conducted without the use of EFM. In other words, this test can be used as a middling to poor substitute for an NST in developing countries where there is no access to electronic fetal monitoring. It is NOT in any way a substitute for a real NST, which, as we already know, is the gold standard. (Just as an aside, this paper cited in support of the accuracy of the auscultation test is grossly underpowered to measure anything and therefore, is meaningless). 1. Melissa Cheyney and the Board of Direct Entry Midwifery have implicitly acknowledged that the NST is the gold standard for assessing fetal well being. 2. Homebirth midwives have no access to the technology. (That, of course, means that they have no business taking care of women, but that’s another matter altogether). 3. Therefore, they’ve come up with the Flintstones equivalent of an NST, a test that was literally designed to be used in places that have little more than stone age technology. 4. This Flintstones equivalent, just like the mammoth vacuum looks like an NST, but just as the mammoth vacuum doesn’t clean the floor, the auscultation acceleration test literally cannot produce any meaningful results. That’s because the measuring instrument (a watch) is not calibrated for accuracy; the time keeper listening in a 5 second increment is literally incapable of accurately calculating the fetal heart rate, and the test has never been shown to work in any case. Exactly how stupid does Melissa Cheyney think the women of Oregon are? How stupid does she think the legislators of Oregon are? This is not a “test.” This is yet another pathetic effort to convince everyone that no education and no technology are required to ensure fetal health at the hands of birth junkie hobbyists who can’t be bothered to get a real midwifery degree and simply proclaim themselves “midwives.” It is an attempt to fool the public and fool the regulators into letting these self proclaimed midwives make money despite their ignorance, regardless of how many babies are harmed or die in the process. For those who believe that this is anything other than a brazen, self serving attempt to protect hobbyist “midwives” at the expense of babies lives, I’d like to sell you a mammoth vacuum cleaner that you’ll just love. This OB is a hack… just so all you readers know the AAT is the subject of a huge government funded multidisciplinary study being carried out at BC Women’s Hospital, right now. An exemplary hospital in Canada, that is bringing back Breech births and VBAC. Please just treat her like Sarah Palin and turn away. I will turn away now too.